Last weekend’s Maker Faire wasn’t only about the latest and greatest. Some of the groups there brought up the latest and greatest from earlier eras. InfoAge is a historical science and technology learning center based out of the former Camp Evans in Wall, New Jersey, and they really know how to put on a show using old technology. I made it to two booths at Maker Faire claimed by members or associates of InfoAge. First up is the booth from MARCH, the Mid-Atlantic Retro Computing Hobbyists. They’ve got a PDP-8, a PDP-11/20, a few VAXxen, IBM mainframes, entire kilobytes of core memory, and enough C64s, TRS-80s, Commodore PETs, teletypes, and punch cards to get to the moon several times over. The feature of MARCH’s booth was a nearly 100% accurate Apple I reproduction. Yes, the same computer built by hand by [the Steves] who later went on to found Apple Computers. In the video (above, and after the break), a MARCH member demonstrates booting BASIC from a cassette interface with the help of an iPod and typing in a simple program. Next up are the guys from the radio technology museum at InfoAge. They decided to celebrate the 100th anniversary of [Edwin Armstrong]’s invention of the regenerative radio receiver. The regenerative radio receiver is an extremely simple device; it can be built out of baling wire and some variants use only one tube. In the video, [Al] shows off his recreation of a regenerative receiver with fancy olde tymie components that include a variable capacitor and a B cell battery (it’s a recreation using a bunch of 9 Volts, but yes, B batteries do exist). 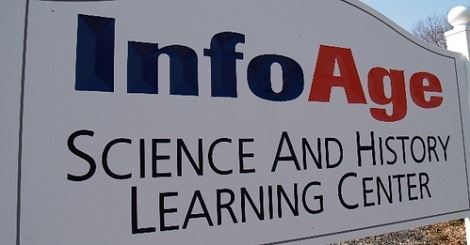 It goes without saying that InfoAge is really cool, and certainly worth the visit if you’re ever in the area. Bonus: it’s only 20 miles away from where [Penzias] and [Wilson] earned their Nobel Prize for discovering the Big Bang. Thank you Hackaday for featuring InfoAge exhibits! In addition to the vintage computer and antique radio groups, InfoAge also hosts a hackerspace; shipwreck museum; amateur radio club; electronics warfare exhibit; military communications displays; Apollo Guidance Computer; and (coming soon) military vehicles and model trains. Do you have a DSKY unit? Nope, we only have the computer itself. Thanks for posting this.. Infoage is one of those little known but great places to check out.. This guy kind of reminds me of young Steve Jobs both visually and audibly. Andrew, I think you mean Woz, Jobs was the skinny guy who recently passed away. Note: a “B” cell and a “B battery” are different things. The “B cell” was developed for an early flashlight (torch to the British). The “B battery” is what is described on the Wiki link. Send an email to dwobser [at] gmail. He leads the hackerspace. Thanks Evan :-) I wasn’t able to respond from work. Man, I want that PDP-8 so bad…. You can’t have it, but you may visit it almost any Sunday, and by appointment at other times. Email me for details: evan[at]infoage[dot]org.